Amy Prendergast studied English and French at NUI Galway where she gained a first class honours degree, as well as receiving a French Government Medal and several NUI prizes. She then went on to complete an MA in Modern Literary Studies at Queen’s University Belfast, before receiving a PRTLI Government of Ireland scholarship to complete her PhD at Trinity. Since then she has been an Irish Research Council Postdoctoral Fellow and a Research Associate at Marsh's Library, before taking up the position of Teaching Fellow at Trinity. 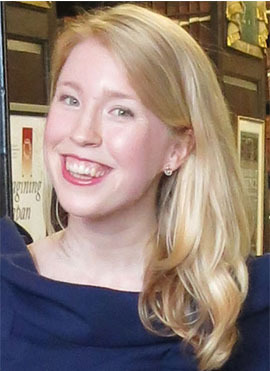 Amy's research focuses particularly on literary history of the long eighteenth century, women's writing in Ireland at this time, life writing, and Franco-Irish connections. Her monograph, Literary Salons Across Britain and Ireland in the Long Eighteenth Century (Palgrave, 2015), has been positively reviewed nationally and internationally. Other peer-reviewed publications include research on authors Frances Sheridan and Maria Edgeworth, and the salon hostess Lady Moira. Current projects involve research on the novelist and playwright Elizabeth Griffith, considering her role as translator and editor, supported by the receipt of a NUIG Moore Institute Fellowship. In the medium term, Amy is working on her second monograph, provisionally titled, Women's Diaries in Ireland, 1750–1820: Narrating Society, Negotiating Selfhood. This project takes both a quantitative and qualitative approach to women's life writing in order to ascertain questions of national identity, literary influence, and the emergence of a recognisably Irish female writing tradition. The value of this work has recently been recognised by the awarding of fellowships from the American Society for Eighteenth-Century Studies and the Huntington Library California, enabling archival research in America. Amy contributes to several undergraduate and postgraduate courses in the School of English and Oscar Wilde Centre, including offering seminars on literature of the long eighteenth century for the MPhil in Irish Writing, coordinating the freshman modules on Enlightenment and Single Author: Oliver Goldsmith, and convening two Sophister option modules. In 2017-18 these options are on 'Hobgoblin Romances and Shilling Shockers: The Rise of the Literary Gothic 1750-1830' and 'Poets, Playwrights and Prostitutes: Literary Life in Eighteenth-Century Dublin'. Office Hours: Tuesday 3.00-5.00 p.m. or by appointment.